Hardly anyone would dispute that in today’s gospel passage, you would find one of the most beautiful dialogues from all of the four Gospels, and perhaps in all of Sacred Scripture. 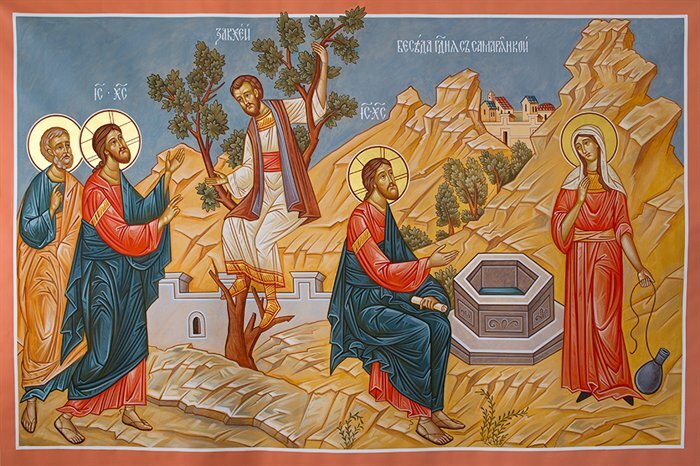 Christ our Lord, wearied from His travels, sits by a well in Samaria, and asks a woman who happens to be there to give Him a drink of water. The woman is taken aback, that a man should break taboo and speak to her, let alone a Jewish man (the Jews and Samaritans were not on good terms). So as expected, she reacts with cold defensiveness. The mutual aversion and hostility of both races to each other may be lost on many of us moderns. However, a Jewish Mishnah may provide a pretty accurate idea of how they felt about each other, “He that eats the bread of the Samaritans is like to one that eats the flesh of swine.” Sounds familiar? Thereafter, their exchange seems to descend into a friendly battle of wit. Nevertheless, Christ is not put off by her initial unfriendliness. He gently persists and gradually brings their conversation to a point where she is ready for Truth, and He reveals Himself to her as the Messiah. The conversation between the two fascinates me. It helped me understand how the Lord mercifully courts sinners even when the latter chooses to play hard ball. It pointed me to an amazing characteristic of the Lord in the face of the cynicism and sarcasm of a sceptic, and how authentic mercy can win over another hardened sinner. Aggressive polemics seldom win converts. There is a discernible process in which the Lord leads this woman out of her life of despondency and sin into that of grace. First. He meets her where she is. He didn’t keep a safe distance by avoiding her like the plague for fear that any association with this woman would sully His reputation. Second. He gently but firmly helps her to recognise her weaknesses, her spiritual lack and her sinful lifestyle. In order to offer her mercy, He had to bring her to repentance; and to do that, He had to reveal to her the truth of her sins. He did so, and he did so very clearly, and also gently. Third. He leads her to recognise Him. For indeed, the Lord Himself, is the Way, the Truth and the Life. No one can go to the Father except through Him. She didn’t need a counsellor, or a companion, or a confidante. She needed a Messiah, a Saviour. Finally, He invites her to participate in that very mission of saving souls and commissions her to bear testimony of Him to others, thus putting her on par with the other apostles. The story shows that Jesus offers divine mercy in the living water of grace, which washes away sins and cleanses souls. The woman went to the well to get a jug of water. Instead, she got so much more; she actually got a cleansed and refreshed spiritual life. This story brings out two important underlying themes, Mercy and Truth. The popular notion is that Mercy and Truth are at odds with each other. Mercy dispenses with the need for Truth, and too much Truth is always unmerciful. What they fail to realise is that the Church holds both together in harmony. Today’s reading is a good reminder that there be no false divide between mercy and truth. In fact, they are one. Mercy is the best path to Truth and Mercy without Truth is not Mercy. Obviously we should make one point clear: mercy is not about hiding or burying one’s face in the sand, or turning the other way so that you may appear not to have seen a situation that requires action. On the contrary, mercy can only be mercy when it rests on the bosom of truth, the truth about man – sinful man but also the truth about Jesus, Our Saviour and Our Lord, the Lamb of God who alone can take away the sins of the world. The encounter of Jesus and the Samaritan woman offers us a good example. 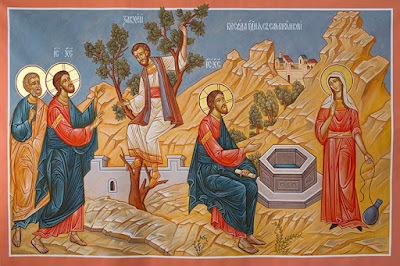 Here, we see both mercy and truth working hand in glove to bring about the conversion of the Samaritan woman. The Lord dealt with her mercifully by not avoiding her and treating her like a human person worthy of respect. But He also challenged her with the Truth of her sinful life and that of true worship. Mercy demands that the truth be told. This story teaches us that people are not afraid about the truths of their lives, even the most embarrassing truths, as long as they come to recognise that that very Truth is not meant to be used as a weapon to further injure or humiliate them, but rather it is the very means by which they will be set free. And to the Elect who are gathered here for the First Rite of Scrutiny and Exorcism, remember this story of the Samaritan woman because it is also your story. The thirst for truth –like the Samaritan woman, this is the first condition required of us in order to meet the Living God in life. Following the thirst for truth, you have journeyed in the RCIA these past few months. You have come to encounter the Truth not just merely in the dead text of doctrine or Sacred Scripture but in a person. Yes, for us Christians, Truth is not just a mathematical equation or a scientific discovery nor is it a philosophical hypothesis. Truth is the Lord Himself. It is He who tells us, “I am the Way, the Truth, and the Life.” But it is not enough that you thirst for the Truth and come to know Him. Here is the final condition, without which the sprout of the quickening spirit will wither. You need to live in truth every minute; you need to experience your life constantly in the presence of the Living God. Here He is, with me. He sees my actions, He anticipates the feelings of my heart, He sees the movement of my mind.